We aim to give you the best car-buying and service experience possible at Midtown Toyota. That means making sure you have the answers you need when you’re browsing our inventory of new Toyota cars or need new Toyota car parts for your vehicle. If you have a question that’s not answered here, give us a call at (877) 899-6206 or get in touch online. We’ll do our best to assist you. Q: What should I look for when I test drive a car? A: First come prepared with a checklist of priorities when you test drive a new or pre-owned Toyota car. Consider aspects like seat and cabin comfort, ease of use when it comes to the controls, responsiveness and road noise, as well as the functionality of features like the navigation system or Bluetooth®. Q: Is there a day of the week that’s best for purchasing a new car? A: Since many customers purchase cars during the weekend, you might find luck outside of those peak hours on Mondays and Thursdays. Q: Can I receive service for my car without an appointment? A: If you’re pressed for time or need a quick look at your vehicle, you can take advantage of our Toyota Express Maintenance service to get in and out as fast as possible. Q: How often do I need an oil change? A: This routine check is key to keeping everything running smoothly. The general rule of thumb is to seek an oil change approximately every 3,000 to 5,000 miles. This can vary depending on factors like the climate you drive in or what kind of driving you do (highway or city). Schedule an appointment at our Toyota service center in Chicago. Q: Do you offer assistance with vehicle trade-in appraisal? A: At our Toyota finance center in Chicago, IL, our team is here to help value your trade-in. If you’re curious about a quote before you come in to speak to a finance team member, use our line trade-in value tool. Q: Where can I find financing specials? A: We’re proud to offer a wide range of leasing specials, rebates, and special programs on our website. Please feel free to browse all offers and reach out with any questions. Q: Are you open on Sunday? A: We are not open on Sunday, but we do operate Monday through Friday from 9:00 am to 8:00 pm in our sales and finance departments. 9:00 am to 6:00 pm on Saturday. Our service and parts centers open bright and early at 6:30 am and close at 5:00 pm Monday through Friday and from 7:00 am to 3:00 pm on Saturday. 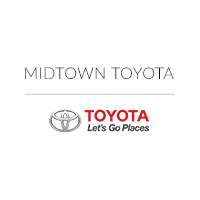 Q: Why should I choose Midtown Toyota? A: We’re Chicagoland Toyota dealers who are proud to serve communities like Oak Park, River Forest, River Grove, Elmwood Park, and Chicago. We want every customer to feel welcome, which is why our Spanish- and Polish-speaking staff are here to provide a great experience.